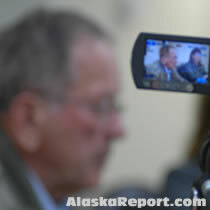 Prosecutors today revealed that they have a recording of Ted Stevens admitting his guilt in accepting over $250,000 in gifts and repairs to his Girdwood, Alaska home. "You'll learn that the defendant never paid VECO a dime for the work on the chalet. Not a penny," Justice Department prosecutor Brenda Morris told a packed courtroom in her opening statement of the criminal trial against Stevens. A 7-count indictment claims VECO and its chief executive officer, Bill Allen, provided free home improvements, including a first floor, a garage, a first- and second-story wraparound deck, plumbing and wiring, and multiple gifts including a $29,000 fish sculpture. "One of the guys will tell you that he was told by Bill Allen to keep it quiet, that it would be bad if the public found out," prosecutor Morris said. "This is a simple case about a public official who took hundreds and thousand of dollars worth of free financial benefits, and then took away the publics right to know that information." In a undercover taped conversation by Bill Allen, Stevens said that the worst that could happen to them if anyone found about what the company had done for him is they would have to spend a lot of money on lawyers and perhaps serve jail time. "No one's going to be killed, just some legal bills and a little jail time."